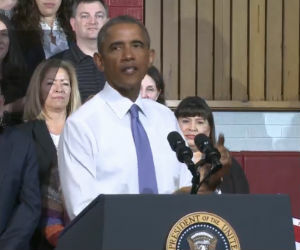 In his speech today on housing in Arizona, U.S. President Barack Obama addressed new housing initiatives, including lowering the Federal Housing Administration (FHA) rates, winding down Fannie and Freddie and continuing to crack down on shoddy lending practices. "Starting this month, the Federal Housing Authority will lower its rates enough to save the average borrower more than $900 a year," "Over time, this is going to potentially have an impact over millions of families all across the country. It should help further accelerate growth in the housing market and stabilizing prices in areas like Arizona that have a long way to come back." He urged that the lower rates are for responsible home buyers, "We want to make sure these homeowners get a good deal, and they get a little bit of help." The FHA mortgage insurance premium cut Obama announced drops the FHA mortgage insurance premium from 1.35% to 0.85%. Administration officials said the move would help 800,000 homeowners who refinance their mortgages save money, and draw 250,000 new homeowners into the market over the next three years. Obama also said he's urging Congress to wind down Fannie Mae and Freddie Mac, something in early 2011, the Obama administration called for. In 2013, the President urged for a replacement of the GSEs with a new government mortgage reinsurer that would be more insulated from financial reverses. Obama added that his administration plans to continue working with state agencies to crack down on shoddy lending practices. "Don't get me wrong, we are all about making a profit, but the days of making bad bets on taxpayer money are over. We've worked too hard to go back that." Click here to view our full coverage on the FHA mortgage premium reduction.